A classic design with a modern twist, this bold armchair will complement a broad variety of interiors with its cosmopolitan flair. 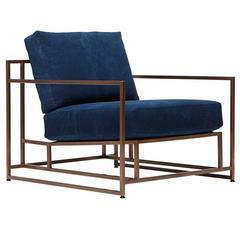 Crafted of solid Canaletto walnut with a squared, open frame, the back is supported by leather straps that run vertically and are fastened to the frame with brass frogs, while the seat rests on beech slats. The removable cushions are in a versatile taupe fabric that will suit any interior palette. Showcased alongside other armchairs by the same designer, this dynamic piece will fit the character of any modern interior. 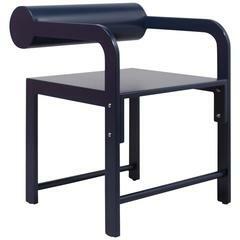 Pull up chair finished in black and upholstered inside and outside back in antique Indigo textile from, Africa. Seat is covered in coordinating solid fabric. 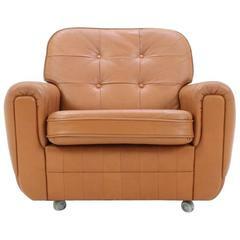 Comfortable leather Mid-Century brown armchair. 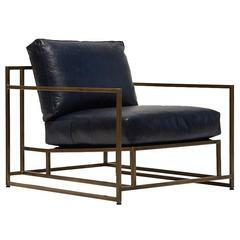 Armchair on beechwood legs with riveted leather seating from former Yugoslavia. 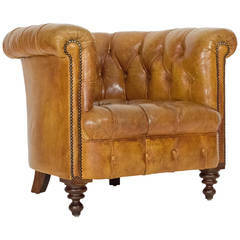 Camel colored leather arm chair. Tufting is in good condition. Nice patina, solid frame and comfortable. Chair is in our NYC showroom in the New York Design Center.